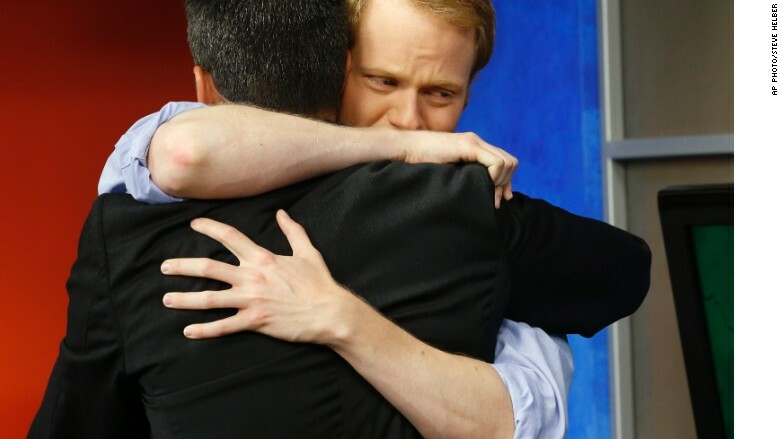 As the WDBJ newsroom in Roanoke, Virginia, grappled with the most painful story in its history, the murder of two co-workers on live TV, it had exemplary help from counterparts in other states. A news desk manager and a jack-of-all-trades journalist flew in from Wichita, Kansas. A morning producer flew in from South Bend, Indiana. And a backup anchorman flew in from Springfield, Missouri. In all, about a dozen journalists came to Roanoke from other stations owned by the same company as WDBJ -- Schurz Communications. They came to help anyway they could. Some worked the overnight shift so grieving staffers could sleep. Others handled mundane tasks like managing Facebook comments. The anchor stood by "in case someone didn't feel they could make it through a show," but "they all did," said Marci Burdick, Schurz's senior vice president of broadcasting. 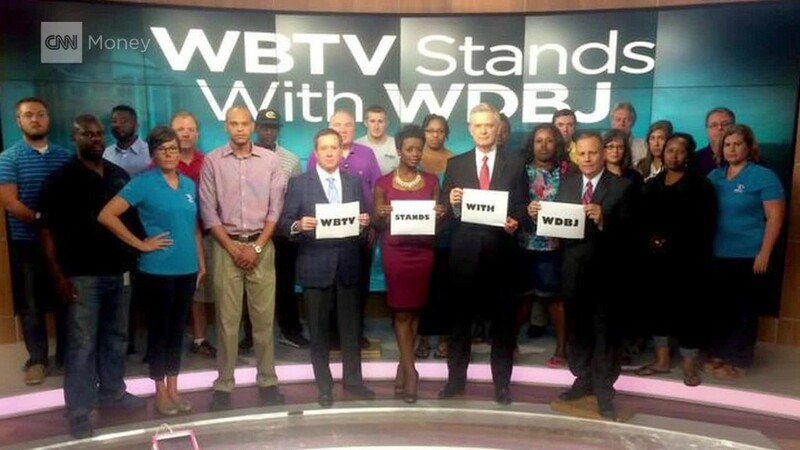 The WDBJ staff showed extraordinary resilience in the days following the August 26 killings of reporter Alison Parker and Adam Ward by ex-employee Vester Flanagan. "We've held it together with the help of friends," the station's general manager Jeff Marks said. Parker and Ward were attacked during a 6:45 a.m. broadcast at a local lake. Rival TV stations in Roanoke immediately reached out to Marks and offered assistance. One of the stations, WSLS, ended up providing news video to WDBJ that day because the station didn't send any crews out after the shooting. National news outlets like CNN and Fox News also provided WDBJ with some technical assistance. WDBJ is a CNN affiliate. The most extensive support came from Schurz Communications colleagues in other states. The company is based in Indiana, but Burdick was in Missouri to surprise her daughter, who was turning 30. When Marks called with the news of the shooting, Burdick started driving to the St. Louis airport. While Burdick was in the car, the general manager of the company's station in Wichita, Joan Barrett, was working the phones. She was arranging to send "jump teams" from her station, KWCH, and from Schurz's two stations in Springfield, KSPR and KYTV. The initial reinforcements arrived by mid-afternoon Wednesday. Kelly Zuber, WDBJ's news director, worked out a schedule. Burdick and several others took the overnight shift. "I knew the WDBJ management team would want to stay around the clock, operating on adrenaline. I also knew they couldn't," Burdick said. "It is going to be a long haul ... and they needed to keep up their physical and emotional strength." By the weekend, two more producers -- "relief troops," Marks called them -- had flown in. WDBJ always remained in charge -- and many people have commented on the extraordinary composure of the anchors and reporters. But in the immediate aftermath of the shooting, the extra staff from other states handled "some of the more difficult stories," Marks said. One example was the reopening of the Smith Mountain Lake area where the shooting took place. The support staff also "answered phones, took seemingly non-stop requests for interviews and back-stopped traditional newsgathering activities -- by writing scripts, making beat calls," Burdick said. And they remained on duty on Monday and Tuesday so that WDBJ staffers could attend the funeral services for Parker and Ward. Marks said a retired anchorman from the station, Keith Humphry, returned to anchor on Tuesday. And Andrew Freidan, a former meteorologist who now works for a station in Richmond, came back to cover the weather. "You know when someone is hurting and you want to help them in some way? Most of the time we come up short. But in this case, I was able to actually do something for my friends at WDBJ7," Freidan wrote in a Facebook post. "They are beautiful people suffering a great loss and my boss at NBC12 didn't bat an eye when I asked him if I could go to Roanoke for a couple of days." 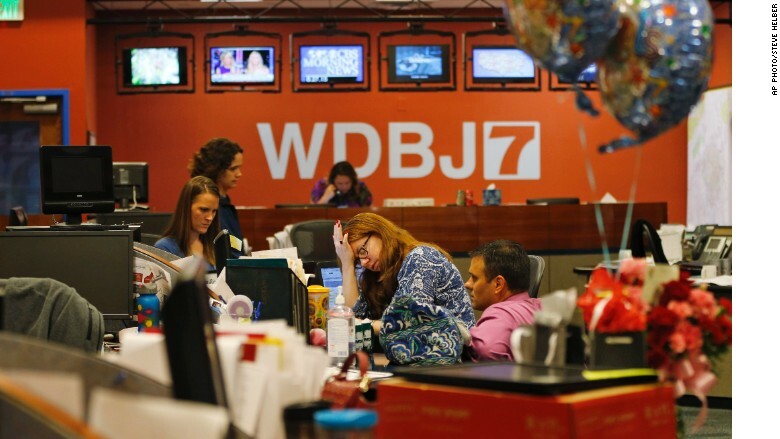 Burdick said most of the support staffers will be leaving by Thursday, but will be available to come back if and when WDBJ staffers seek to take time off.